Environmental Health Safety & Risk Management supports the NMSU mission by promoting a safe, healthful environment in a proactive and cost effective manner that helps the University community minimize their risk. Environmental Health Safety & Risk Management is committed to facilitating University safety, health and environmental protection by providing and coordinating programs and services that support teaching, learning and research activities. Through these EHS&RM programs and our partnerships with various constituents of the campus and regulatory agencies, we prevent personal injury, recognize and control hazards, minimize risk and loss, and provide leadership in environmental stewardship. NMSU will be a recognized leader by customers, regulators, and our peers in establishing an effective safety culture which holds employees at all levels accountable for environment, health, and safety performance. Our goals are to have a workplace free of injuries and hazardous exposures, to prevent or minimize any adverse impact to the environment, to provide services of the highest quality to the NMSU system and to be recognized as leaders in the areas of environmental protection, health and safety. Responsibility for health, safety and environmental protection will be an integral requirement of all employees and students of New Mexico State University. Our department will be comprised of individuals committed to our mission, achieving our vision and the highest professional practices and standards. We provide quality services to our customers by understanding their individual needs and measuring our effectiveness. We carry out our responsibilities with knowledgeable professionalism. We provide innovative, reasonable and timely solutions. We empower and require accountability of our team in a supportive work environment where we can achieve our full potential. The EHS&RM Team will practice their profession by following recognized scientific principles and management practices, factually communicating to affected parties their findings in an honest, straightforward manner, exhibit the highest level of integrity, honesty and empathy, while never compromising the public’s welfare. Our team will strive to be involved in continual education and professional development, to provide superior customer service in all areas, to perform service only in the areas of their competence, and maintain information as confidential when appropriate. EHS&RM provides comprehensive services for New Mexico State University; both standard services provided by central funding and those deemed special services, outside of what is routine and customary. Please view the following document for a list of those services. 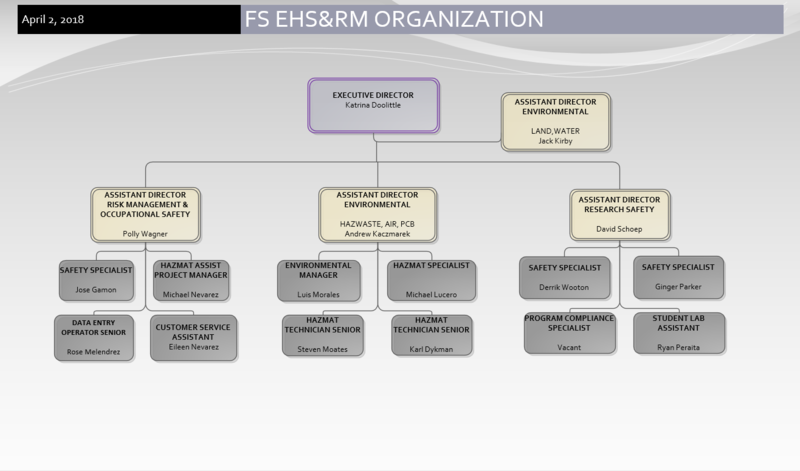 Please see the Facilities and Services EHS&RM Organizational Chart for the structure of our programs and our team members. To contact our team members directly please see our departmental listing in the NMSU Phonebook.